Ragi, a.k.a. 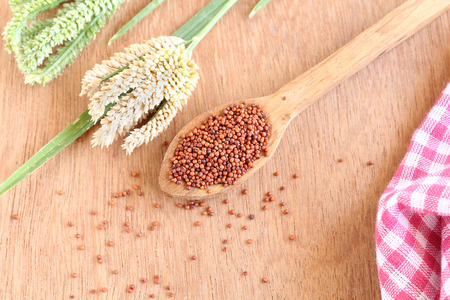 finger millet originated in Africa and has been cultivated for many thousands of years in Uganda and Ethiopia. In India, the crop was probably introduced 4000 years ago, and has been found in archeological excavations in the Harappan Civilization. The grain's protein content is comparable to that of rice. However, some ragi varieties have shown double that level. More importantly, this protein content is quite unique. The main protein fraction is eleusinin, which has a high biological value, meaning that it is easily incorporated into the body. There are also significant quantities of tryptophan, cystine, methionine and total aromatic amino acids. If that sounds too complicated, all you need to know is that these are considered crucial to human health, and that most cereals are deficient in these components. This high protein content makes finger millet a very important factor in preventing malnutrition. The cereal can be an especially good source of protein for vegetarians because of its methionine content that constitutes about 5% of the protein. The grain's seed coat is abundant in polyphenols and dietary fibres as compared to rice, maize or wheat. The low glycemic index lessens food cravings and maintains the digestive pace, consequently, keeping blood sugar within the safe range. Ragi works wonders for maintaining young and youthful skin. Vital amino acids like Methionine and Lysine present in it make the skin tissues less prone to wrinkles and sagging.